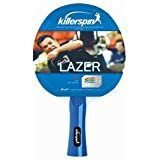 The Lazer is a perfect racket for advanced beginners looking to improve their technique with more power and speed. 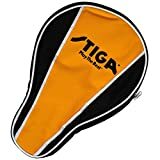 The STIGA Racket Cover offers a layer of protection for your table tennis racket. Whether you play table tennis on the go or only use your paddle at home, the durable vinyl cover is designed to guard the racket from damage. Using a racket cover decreases the build-up of dust on the face of your paddle and increases the tack life of the rubber. The oversized design of the STIGA racket cover allows for easy opening and closing, and depending on the size of your rackets, can hold 1-2 rackets. This cover is approved by USA Table Tennis (USATT) and will extend the life of your paddle. The STIGA Aspire is an entry level racket that is perfect for the recreational level table tennis player. The lower spin and speed ratings for this racket make it a great choice for the player that is still building skills. This racket is great for kids and is the perfect accessory for your rec room table tennis table. In the Medieval Age, the ranseur was a long spear generally topped with two or more points and like the Ranseur racket, is a highly effective weapon whether used for attacking or defending. This racket offers a nice combination of speed and control for the recreational player, while still generating a good degree of spin.